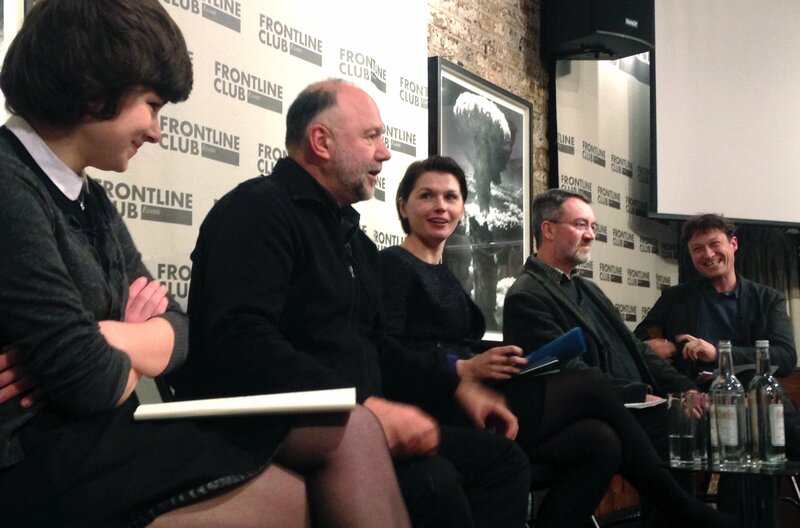 (l-r) Tonia Samsonova, Andrey Kurkov, Orysia Lutsevych, Robert Brinkley, and Gabriel Gatehouse. A year since revolution erupted in Ukraine has marked increasingly violent changes inside the country. Yet the transformation remains unfinished and it is uncertain where the conflict and efforts to reform corruption will go next as fighting intensifies across the east of the country. To discuss the future of Ukraine, and whether 2015 will see an end to the conflict, BBC correspondent Gabriel Gatehouse moderated a conversation between leading experts at the Frontline Club on Tuesday 4 February. Panelists included: acclaimed Ukrainian writer and commentator, Andrey Kurkov; Chatham House Russia and Eurasia Programme research fellow, Orysia Lutsevych; former British Ambassador to Ukraine from 2002-06, Robert Brinkley; and Tonia Samsonova, a London correspondent for Echo of Moscow. Since the most violent clashes of the Euromaidan protests broke out in Kiev on 18 February 2014, fighting has become increasingly bloody as Russia and the West have thrown their support behind different factions battling to pull the country in separate directions. What next after a broken cease-fire? Recent United Nations figures mark the death toll in the Ukraine conflict at more than 5,000 people since all-out battles between armed factions began in April 2014. Fighting has intensified in recent weeks as the September Minsk cease-fire agreement disintegrated, with calls from Russian-speaking rebels to mobilise more troops. What could possibly fix the situation? Accusations of corruption are rife throughout Ukraine’s government and institutions. Transparency International’s Corruption Perceptions Index ranks the country 142nd in the world, alongside Uganda. How can things get better?